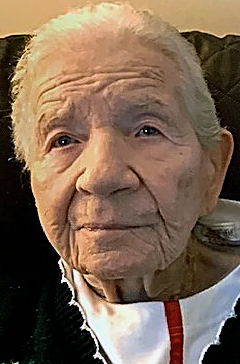 YOUNGSTOWN — Angeline Terletsky, 95, died Thursday with her family by her side. Angeline, affectionally known as Ang, was born Dec. 26, 1923 in Youngstown, a daughter of the late Emilio and Elvira (Tisone) Belline. Ang was a 1941 graduate of East High School. She was a homemaker. She was a member of Our Lady of Sorrows Parish at St. Matthias, where she was active with Infant Jesus of Prague. She is survived by her husband of 73 years, Peter Terletsky of Youngstown, whom she married June 23, 1945; two daughters, Elvira Terletsky of Youngstown and Patricia (Tim) Morrow of Struthers; and two grandchildren. A private Memorial Mass will be held at a later date. Arrangements are being handled by Stark Memorial Funeral Home and Cremations Services, Salem. To view this obituary or send condolences please visit www.starkmeorial.com.